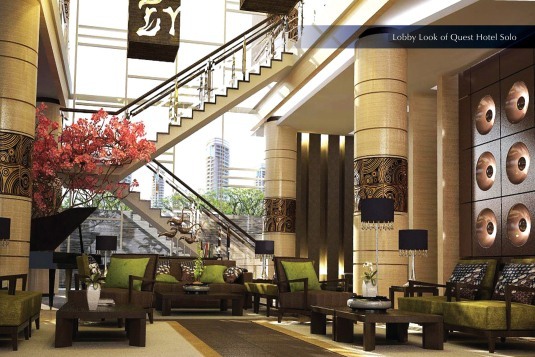 Jakarta, December 27th, 2012 – Aston International continue its expands its 3 star lifestyle Quest Hotel brand with the recent Ground Breaking of the Quest Hotel Solo and developed by PT. Kaloka Land Hotel & Resort. 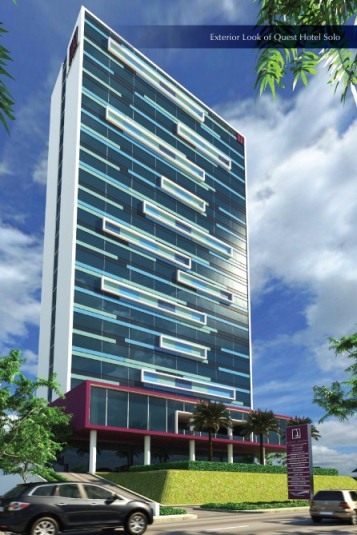 The Quest Hotel Solo will be a 3 star affordable lifestyle hotel conceptualized to accommodate an increasing number of domestic Indonesia leisure travelers as well as a new breed of younger and more style oriented and technology savvy business travelers. The hotel will feature 180 airy guest rooms and a state of the art conference center with several meeting rooms and one of Solo’s largest ballrooms. In addition the new Quest will feature an eclectic lobby lounge designed to become one of Solo’s most attractive casual meeting places, a indoor and outdoor restaurant and ample of recreational facilities such as a swimming pool with pool bar, a day spa and a well equipped gym. Solo, which is officially called Surakarta, is a popular historic Javanese city located North East 60 km from Yogyakarta which is shares several popular tourist attractions including Borobudur. Surakarta is also well known for its Javanese court (Kraton) and refined, highly polished and sophisticated Javanese art scene building world famous Batiks. Aston International’s Vice President of Sales & Marketing, Mr. Norbert Vas, said: “Solo is a perfect match for Quest which aims to offer a somewhat unusual an esthetically pleasing mid market hotel experience. Our other Central Javanese Quest, the Quest Hotel Semarang, is one of the most popular hotels in the region enjoying occupancy levels of well above 90% and we are confident that the Quest Solo will be equally received”. Seen in the images, Mr. Winston Hanes - General Manager of Aston International (forth from left), Mr. Ir. Setyo Wisnu Broto, MM - President Director of PT. Kaloka Land Hotel & Resort also as the owner of Quest Hotel Solo (fifth from left) and Mr. Bimo Putranto - Vice CEO of PT. Kaloka Land Hotel & Resort (sixth from left). Quest Hotel is Aston International’s affordable life-style 3 star hotel brand which aims to combine the value of premium budget hotels with unique and inspiring designs, creative hospitality concepts and state of the art technology for travelers seeking a stylish yet unpretentious environment. Aston’s brands cover the entire spectrum of the accommodation market and range from ultra luxurious private pool villas to serviced apartments and select service economy class hotels, thus offering travelers Indonesia’s vastest and most comprehensive hotel network.